You are here: Home / Den Talk / Lions sign DE Jeremy Geathers, Ricky Foley released by Seahawks. Lions sign DE Jeremy Geathers, Ricky Foley released by Seahawks. BCLions.com: The BC Lions Football Club announced today that import defensive lineman Jeremy Geathers has been signed by the team and placed on the practice roster. Geathers appeared in 23 games over two years with UNLV (’06-’07) and registered 18.5 sacks before being signed as an undrafted free agent by the New Orleans Saints in 2008. The Louisiana native was released in training camp that year and most recently played for the Spokane Shock of the Arena Football League. 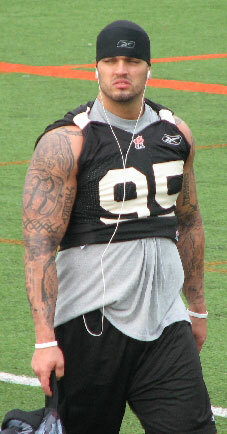 In other news, former 2009 CFL defensive player of the year Ricky Foley has been released by the Seattle Seahawks. Reports by Lowell Ullrich indicate Foley will head east to ponder his future, but a return west to the Lions has not been ruled out. Foley will return to the CFL as a free agent if he’s not picked up by another NFL club. News 1130 sports have reported on Twitter that Wally Buono has spoken with Foley and receiver Ryan Grice-Mullen since their releases. Both players have 10 days to be picked up by another NFL team. Grice-Mullen was waiting to hear on a possible practice roster spot according to recent reports.